The RPGKC Website is an online information service provided by the RPGKC. Although the information is available to anyone, the materials and graphic images used on our site maybe copyrighted by us or others. Therefore, you may not (1) distribute any of the contents (text or graphics) of this site without the express written permission of the appropriate party; (2) include the information on your own server or in your own documents without permission from the RPGKC; (3) modify or re-use the text or graphics located on the RPGKC Website. 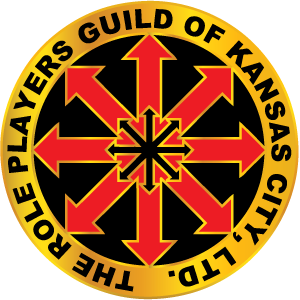 The RPGKC Brand, the RPGKC name, and the logo are trademarks of the Role Players Guild of Kansas City. The names of other companies and products mentioned herein may be the trademarks of their respective owners. Some of the links in this area allow you to leave the RPGKC Website. Linked sites are not under the control of the RPGKC and the RPGKC is not responsible for the contents of any linked site. The links are provided for convenience only. The RPGKC respects the intellectual property rights of others and is committed to complying with U.S. Copyright laws. Our policy is to respond to notices of alleged infringement that comply with the Digital Millennium Copyright Act. The Digital Millennium Copyright Act of 1998 ("DMCA") provides recourse for owners of copyrighted material who believe their rights under U.S. copyright law have been infringed on the Internet. The subscribers name, address, telephone number and email address, and a statement that the subscriber consents to the jurisdiction of the Federal District Court for the judicial district in which the address is located, or if the subscriber's address is outside of the United States, for any judicial district in which the service provider may be found, and that the subscriber will accept service of process from the person who provided notification or an agent of such person. We use Google Analytics for web traffic analysis. View Google's Terms of Service.